Properties in Katikati average 4.6 out of 5 stars. Property 4: Gorgeous cottage beside stoney bottom stream! Property 5: Private, quiet, cottage adjoining stream. Property 6: Stunning, Private, Secure, and Modern Cottage. Honey Fields Cottage, a little piece of paradise! 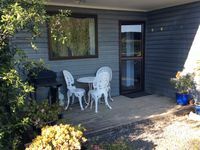 Property 16: Honey Fields Cottage, a little piece of paradise! 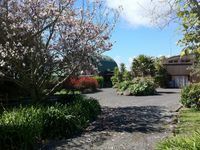 Property 26: Stylish apartment between Waihi Beach and Katikati. Property 27: Comfy home opp Gilmour Lake. Property 28: Self contained cottage next to swimming pool. Property 30: SNAZZY! Right in the middle of the action! Property 32: Family friendly and a short stroll to the beach - you can hear the surf. Property 40: Seperate guest room in serene estuary setting. We had a wonderful and peaceful stay at Crindau Lodge! Location was perfect for our daily trips.